This month my consultancy work led me to delve into the disturbing world of industrial rabbit farming. I may have witnessed my fair share of animal cruelty over the course of my career and become slightly desensitized to shocking images, but as I read the accounts of the Compassion in World Farming undercover investigators who had just visited rabbit farms across Europe, I felt sick to my stomach. They painted a picture of untold animal suffering: huge dark sheds filled with stacked rows of cramped cages; rabbits living on bare wire, uncomfortable and unable to express any kind of natural behavior; females being roughly pulled out of their cages to be artificially inseminated while still nursing kits from their previous gestation. They also depicted appalling sanitary conditions: rabbit waste allowed to pile up underneath the cages and saturating the air with ammonia smells (I think I'll always remember the suffocating odor that overpowers you as you stand outside the door of a factory farm, about to enter); mounds of fur building up on the floor; dead rabbits left to decompose on top of their live mates' cages; rampant infections going untreated in the animals and jumping to the workers; and large quantities of antibiotics being used both prophylactically and curatively. Perhaps what stirred me most was the summary of a farmed rabbit's fate: after a three-month-long existence spent on the wire floor of a barren cage comes the animal's first and last opportunity to breathe fresh air – on the truck to the slaughterhouse. A miserable end then succeeds a miserable life as it is grabbed by its ears and shoved head first into an electrical stunner before having its throat cut. We all get one shot at life, and that's what a farmed rabbit gets. If you're not acquainted with this sort of reality, your reaction may be one of disbelief. After all it does sound extreme, and the nature of so-called modern farming is an uncomfortable truth to have to accept. So when I talk about the animal suffering on factory farms, more often than not I am met with the response that surely I must be campaigning on the back of isolated cases. Unfortunately, in today's world the extreme is the norm: around 330 million rabbits are reared in barren cages for meat production across the EU. This accounts for 99 percent – yes, 99 percent – of all rabbits farmed for their meat, so I'm afraid there's very little chance indeed that the rabbit in your stew enjoyed a decent life. Another common response from the general public is that this can't possibly be going on in countries which have national animal welfare legislation and fall under EU standards. But there is no species-specific legislation protecting the welfare of farmed rabbits in the EU and, with powerful agricultural lobbies and little political will to challenge them, the enforcement of standards by Member States remains problematic anyway. A few months ago, a French NGO named L214 (after the French Rural Code article which recognizes animals as sentient beings) released secret footage from an industrial rabbit farm operating in Brittany. Just like Compassion in World Farming's, L214's images showed immense animal suffering and deplorable sanitary conditions. After ordering an official inspection of the farm, the local prefecture declared the farm to be compliant with current environmental and animal welfare legislation. The farmer then lodged a complaint against L214, and the courts ordered for the images to be pulled from the public domain so as not to cause the farmer any economic loss. Millions of rabbits are also farmed for their fur (to make coats, hats, gloves, shoes, fur-trimmed garments, accessories, ornaments, pet toys, etc.). Contrary to popular belief, fur is not a by-product of the meat industry. Rabbits reared for meat are usually slaughtered around the age of 10 to 12 weeks (when their flesh is pale and their skin thin), whereas rabbits bred for their fur are killed at the age of several months (when their skin and coat are thicker). Last year, PETA highlighted one particular type of fur farming of rabbits, for the angora trade. 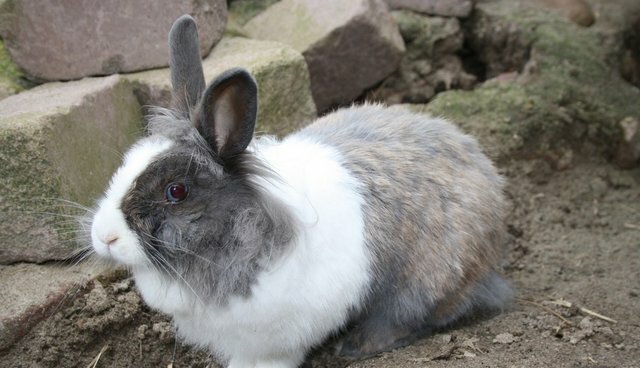 Angora is a luxury fiber produced by long-haired rabbits, and 90 percent comes from China, where 50 million angora rabbits are industrially farmed without any legislative standards protecting their welfare. PETA's footage showed rabbits tied by their front and hind legs, screaming as they were being plucked raw. The reason for not shearing them, which would be more humane, is that the longer hair that comes from plucking can sell for more than double the price, and the reason for plucking violently in a matter of minutes is that plucking without causing harm would take up to two weeks of gently removing the loosened hair. The outcry over the footage led several big brands (including H&M;) to stop using angora. Call me a bunny hugger, but I think I'll pass on the stew, the fur collar jacket and the fluffy sweater. If, like me, you feel outraged by industrial rabbit farming methods, you might like to sign Compassion in World Farming's petition calling on members of the European Parliament and EU agriculture ministers to make farming rabbits in cages illegal. You can do this here.